Frederik July 22, 2017 Comment? 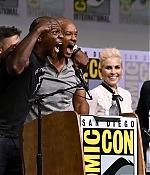 On Thursday, the cast and crew of David Ayer’s upcoming Netflix spectacle “Bright” made a stop at this year’s Comic-Con to premiere the official trailer. 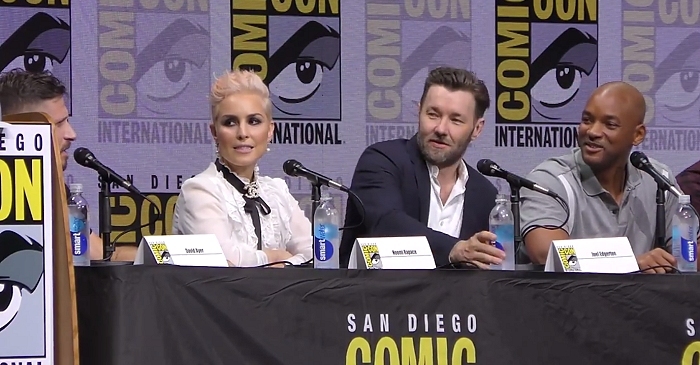 Netflix brought out Suicide Squad director David Ayer on stage along with cast Will Smith, Joel Edgerton, Noomi Rapace, Lucy Fry, Edgar Ramirez and more to talk about the high concept fantasy–set in our reality–film. Ayer went on to discuss that he has plans for a sequel and his inspiration for this kind of movie. He went on to give praised to Netflix for allowing him to make such a fantastical film that looks like something not really seen before. There are elements of humor in the film but doesn’t come off as too zany or slapstick like. What makes this film so unique is the setting in Los Angeles and the creatures that live there like Orcs, Fairies, and Elves living among humans. It also gives off a political tone with the discussion of race and the abuse of magic (power) that really gives it that realistic push that Ayer tends to do. A day before the Comic-Con premiere, they also joined Conan O’Brien on his show – which is held in San Diego during the Comic-Con. Pictures from all events – the panel, press conference and Conan apppearance – have been added to the photo gallery. 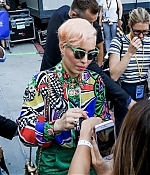 Additionally, videos have been added as well, alongside a first production still and trailer screencaptures of Noomi. Many many thanks to Claudia and Maria for their submissions. “Bright” will debut on Netflix on December 22, 2017.